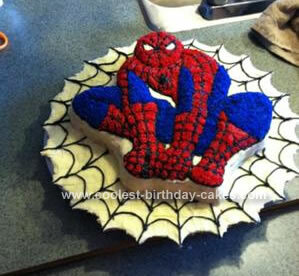 I did this Spiderman birthday cake for my grandson’s 3rd birthday party. I had bought a cake pan from Party City and baked it. I left it sitting for a day. Then I woke up at 6:00 in the morning just to finish it up. I finished it up by making the blue, red, and the black and white icing. I did all of the icing using a star tip to give it a unique design. It took me almost 5 hours just to finish it. Everyone at the party loved the cake and my idea. My grandson was so happy because he is in love with Spiderman. I am looking for this wonderful pan cake #128. I would appreciate your help. Please post or reply at nljhn3@gmail.com.